Access to high-quality medicine is a basic human right, but more than four billion people live in countries where many medications are substandard or fake. Marya Lieberman of the Department of Chemistry and Biochemistry at the University of Notre Dame and Abigail Weaver, a postdoctoral associate in the University’s Department of Civil Engineering and Environmental and Earth Sciences, took up the challenge of how people in developing countries could detect low-quality antimalarial drugs without expensive equipment and without handling dangerous chemicals. The solution they developed involves using paper cards, embedded with reagents, that carry out 12 colorful chemical tests all at once on a solid sample. The colors show whether a medicine contains the expected ingredients and whether fillers or substitute drugs have been added. Weaver’s and Lieberman’s research demonstrated that a library of chemical color tests embedded on a paper card can presumptively identify formulations corresponding to very low-quality antimalarial drugs. 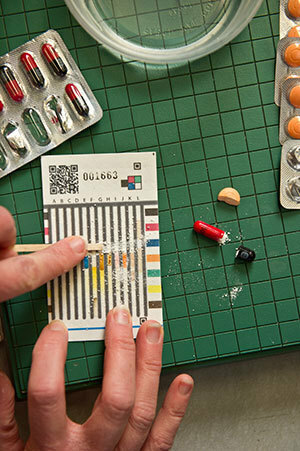 The presence or absence of chloroquine, doxycycline, quinine, sulfadoxine, pyrimethamine and primaquine antimalarial medications, in addition to filers used in low-quality pharmaceuticals, are indicated by patterns of colors that are generated on the test cards. Test card sensitivity for detection of these pure components ranges from 90 percent to 100 percent with no false positives in the absence of a pharmaceutical. These easy-to-use cards will help people in the developing world identify suspicious medications before they harm patients. Tests are simple and inexpensive enough to be carried out in clinics, pharmacies and ports of entry and could provide a screening method to detect suspicious medicines throughout the supply chain. In previous research, the Lieberman group developed paper tests for antibiotics such as amoxicillin. Now that they have developed the test cards, Lieberman and Weaver are working to get them out of the lab and into the world. “Our immediate next step is to test antimalarial drugs collected by collaborators in southeast Asia to see whether the test cards can detect good and bad pills in that sample pool,” Lieberman said. “Next is to use the cards in an ongoing screening program in Kenya. It’s going to require a big push on manufacturing so we can produce larger numbers of cards at even lower cost, as well as development of sophisticated software to enable a computer to read the test results using just a cell phone photograph of a test card. And we can’t lose track of the need to remove low-quality products from the market; this requires additional chemical analysis of suspect products and close coordination with the national medical regulatory agency. The paper appears in a Supplement to the American Journal of Tropical Medicine and Hygiene titled, “The Pandemic of Falsified Medicines: Laboratory and Field Innovations and Policy Perspectives.” The special issue includes 17 papers on detection technologies and methods, data from field surveillance and policy recommendations describing how public health authorities and decision makers can monitor the scope of the problem, identify problems at all stages of the pharmaceutical supply chain and improve the quality of medications. Originally published by William G. Gilroy at news.nd.edu on April 20, 2015.